Granola with a twist. This one is made with cocoa, dried cherries, slivered almonds, coconut and chunks of chocolate. It's a chocolate lovers dream. Combine coconut oil, honey, maple syrup, cocoa powder, brown sugar, salt, cinnamon and nutmeg in a saucepan and bring to a boil over medium heat. Turn down to a medium low heat and cook for about 4 to 5 minutes. Remove from heat and allow to cool slightly. Pour your liquid mixture over your dry mixture. Toss with a spoon until it's all combined and yummy looking. Line a rimmed cookie sheet with parchment paper. Spoon the granola over top. (you can use two cookie sheets if you want a thinner layer which results in dryer granola) Spread out evenly. Pop the cookie sheet in the oven. Cook for about 1 to 1 1/2 hours depending on how dry you like your granola and how many pans you used. I used 1 pan and cooked mine for 1 hour, but I like my granola moister than most people do. So use your judgement to cook to your own taste. If you used two cookie sheets you could likely get away with an hour for dry granola. If you used 1 pan and like it dry I would suggest cooking it for 1 hour and 15 minutes minimum, and maximum 1 hour and 30 minutes. At this point if you want to add chocolate pieces for extra chocolate goodness you can toss it in now. It has to be cooled or the chocolate will just melt. Once it's cool you can crumble it into a container and store it for up to 2 weeks. Or you can do like I did, and pile it on ice cream. 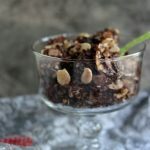 Serve with a big old wicked chocolate granola smile!